2017 NHL Bye Week Stats: Will Teams Struggle After Byes Again In 2018? If you’re a bettor and were quick to catch onto the trend that surrounded teams coming off their 2017 NHL bye week, you made a killing. In the first year that the NHL rolled out a mandated 5-day break for all teams (including practices), teams playing their first games following their bye week posted a combined record of 10-16-4. But when those clubs were facing teams who weren’t also coming off the bye (Rangers/Maple Leafs and Canucks/Sharks last year), the record of teams coming off a bye drops to 8-14-4, a winning percentage of 30.7%. Those records don’t even begin to tell the entire story. Here are some more 2017 NHL bye week stats involving teams playing their first game after the bye week against teams who weren’t coming off a bye. 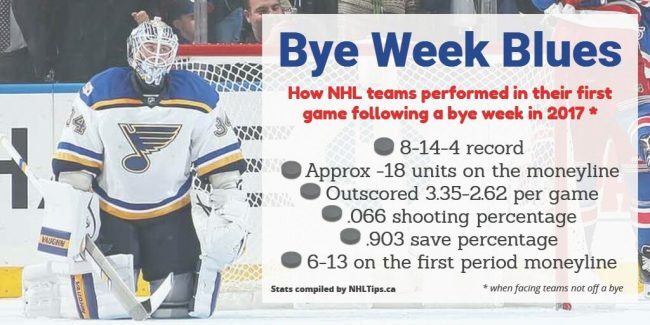 There was plenty of media coverage last year about how NHL teams struggled following their bye week, especially after the first 18 teams posted a mark of 3-11-4 in their first game back from the break. The National Hockey League acknowledged that teams were a disadvantage when playing their first game following 5+ days off (“We don’t think it worked well,” commissioner Gary Bettman told the USA Today during the annual general managers meeting), and made changes in 2017-18 to address them. 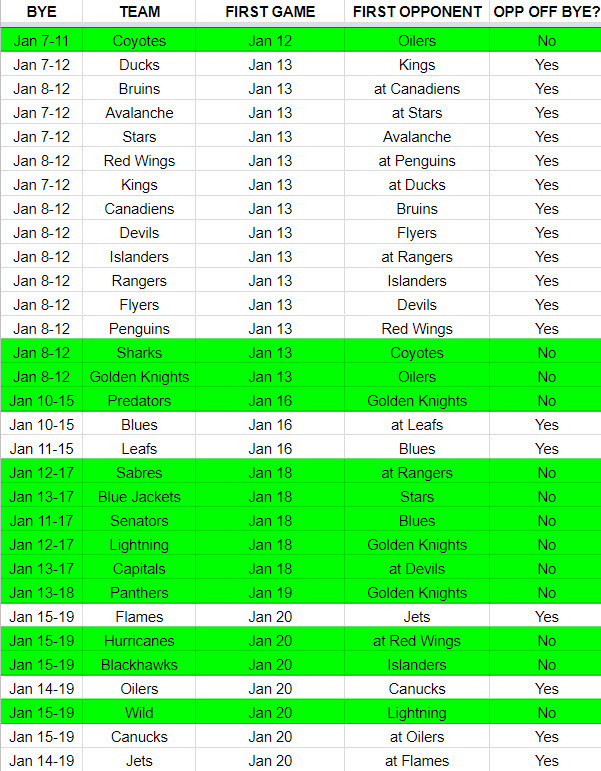 Instead of staggering bye weeks across January, February and March as they did last year, the NHL has scheduled each team’s bye week to take place during a two-week stretch in January. There will also be less games pitting teams off their bye against teams who are playing with regular rest. But there are still matchups involving teams off their bye against teams who are in their normal routine. The biggest benefactors look to be the Vegas Golden Knights, who get to play the Predators, Panthers and Lightning in those teams’ first games back. However, Vegas also has to come off its bye to play the Oilers, who will begin their bye following that game. Below is a full listing of when every NHL team will play its first game after its bye week in 2018. We’ve also highlighted games in which a team coming off a bye will face a team that isn’t coming off their bye, just in case you want to try and capitalize on this trend once again.